MINNEAPOLIS (AP) Andrew Romine played all nine positions and the Detroit Tigers got the win. It didn’t go exactly as planned for manager Brad Ausmus, but it was pretty close. Romine became the fifth major leaguer to play every position in a single game, and the Tigers held off the Minnesota Twins for a 3-2 victory on Saturday night. ”Moving around and stuff, it got hectic, but it was fun,” Romine said. Romine, a 31-year-old utilityman, pitched to Miguel Sano in the eighth, and the All-Star slugger bounced to third on a 3-1 pitch. He topped out at 87 mph on the stadium’s radar gun. Romine then switched to first base, his ninth position of the night. The former Angels draft pick joined Bert Campaneris, Cesar Tovar, Scott Sheldon and Shane Halter on the exclusive list of players to accomplish the feat. Ausmus was Halter’s teammate when he played all nine positions for Detroit against Minnesota on Oct. 1, 2000. Ausmus and Romine had discussed the idea for two years but hadn’t felt like the time was right to carry it out until Saturday night at Target Field with no postseason implications at stake. Romine also played catcher for the first time in the majors for four at-bats in the seventh inning. 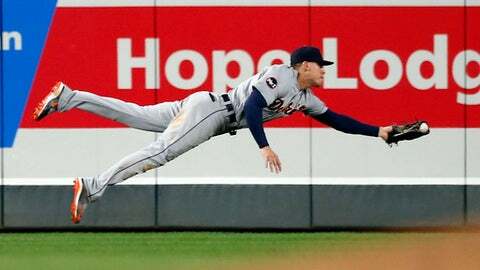 The Twins scored one run off Blaine Hardy to pull within one, and Romine committed a passed ball that caused Ausmus to insert James McCann at catcher and move Romine to second base. Romine made five putouts, including the first and last outs. He began the evening in left field and ended at first, where he fielded Zack Granite’s ground ball to clinch the victory, snapping a six-game losing streak against the Twins. Buck Farmer (5-5) pitched five strong innings for the win, and Shane Greene recorded his ninth save. Aaron Slegers (0-1) took the loss for the Twins, allowing three runs in 4 1/3 innings. In what might have been his final appearance with the Twins, former closer Glen Perkins recorded one out in the eighth inning and asked for the ball on his way to the dugout. Perkins has battled shoulder issues for most of the last two seasons. Detroit finished September with a 6-23 record. It was its worst month since it also went 6-23 in August 2003. The Tigers were outscored 192-106 in September. Tigers: Candelario (left wrist) did not start for the second time in three games but entered as a pinch hitter in the fifth inning. Ausmus said before the game that the switch-hitting Candelario would be fine hitting as a left-handed batter. Twins: DH Sano (shin) made his first start since Aug. 19 and went 1 for 4 in a tuneup for Tuesday’s wild-card game against the Yankees. Tigers: RHP Anibal Sanchez (3-6) gets the ball for the season finale on Sunday, looking for his fourth straight quality start. Twins: RHP Bartolo Colon (4-6) takes the mound after leaving Tuesday’s start in Cleveland after one inning with an illness. Colon has struggled lately with a 9.64 ERA in the month of September.